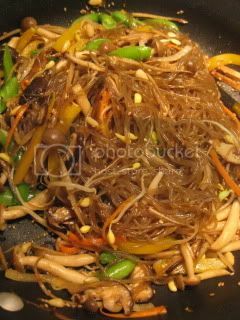 Chapchae (or Japchae, Korean glass noodle dish) is one of the best known Korean dishes among Japanese people. There are many short-cut recipes for this dish, but for the best result, instead of cooking everything together, you want to cook some ingredients separately and assemble at the end. By making this extra effort, the dish creates more layers of flavors and also look much nicer esthetically. 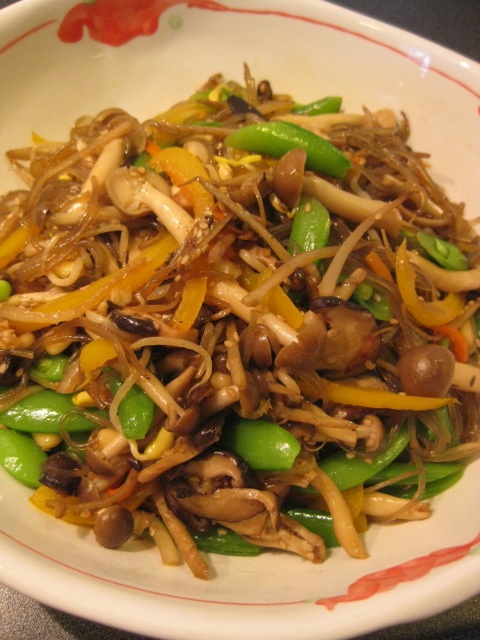 Most typical style of chapchae contains beef, but my version is vegetarian with a lot of mushrooms. So, here's my style chapchae. Cook 3.5 oz dry Korean glass noodle according to the package instructions. Drain and cut by scissors. The quality of the noodle makes a big difference, so I get a nice kind, made from sweet potato starch in Korea. The dry noodle is really tough and the color is grey. Saute 1/2 color bell pepper and 1/3 carrot (both julienned) in olive oil and transfer to a plate. 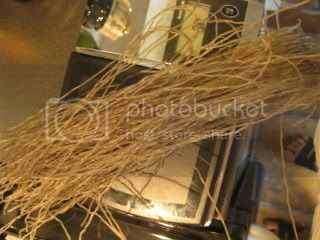 Saute 1/3 burdock root (gobo - julienned ), and 1/4 onion (thinly sliced) in sesame oil for a few minutes. 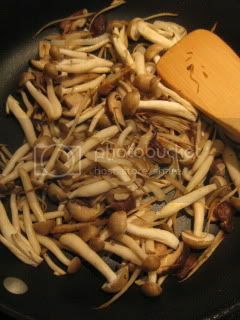 Add 6 medium-size shiitake mushrooms (sliced) and 5 oz shimeji mushrooms and continue to sauté until the mushrooms are soft. 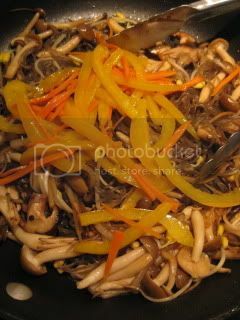 In a small bowl, combine 2T soy sauce, 2T sake, 1T raw brown sugar, 1T mirin, 1/2T grated ginger, and 1 clove garlic (grated). Add the mixture to the pan and stir. 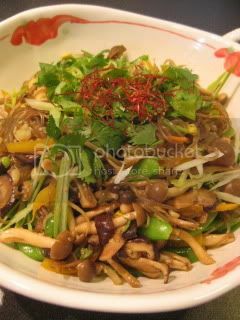 Also add 1/2C soybean sprouts, cooked glass noodles, 1T white sesame seeds, 1T pine nuts, and the cooked bell pepper & carrot. Stir. Adjust the seasoning with salt and pepper, if necessary. To finish, add 1/2C sugar snap peas (blanched and halved in angle), and thinly-sliced scallion. Drizzle a little amount of black vinegar (optional). Garnish with shredded dry chili and cilantro. This dish contains a variety of healthy ingredients and it makes a nice complete meal.